In the past 15 years as a full time Sportfishing outfitter in Tofino B.C., on Vancouver Island’s rugged, beautiful and bountiful west coast, there are always those days that pique your interest and passion to another level. Without these types of events that include special fish, guests, weather or combinations of each, even “professional” anglers can find the routine a little lacklustre. Fortunately for Tofino anglers, this is not very common, and August is anything from lacklustre. We are fortunate in the Tofino area to have such a diverse blend of prime marine habitat, varied transient fish stocks and strong numbers of local or visiting anglers ready for their first or even fiftieth fishing experience that ideally will far “outweigh” the end catch. Tofino’s geographic location provides a perfect landscape for these blending factors to enhance the overall experience, and how it can play out in the favour of all who venture beyond the end of the road. Within Clayoquot Sound or offshore from Tofino’s coastline, a diversity of fishing is available, and August has long been considered as one of the very premier months of the Sportfishing season on Vancouver Island’s west coast. Chinook Salmon action is consistent offshore from Tofino, with the season’s largest Salmon that can reach sizes up to 50 lbs., migrating to various rivers down the coast. Coho Salmon create a steady mix of action in this same area, with many of these acrobatic silvers hitting on or near the surface. Halibut fishing has continued to stay very good through the spring and early summer, with average sizes increased over recent years with many fish in the 35-60 lb class. Trolling medium sized Herring in mid water will often produce great results for Chinook, while Halibut and Bottom fish can be caught using artificial power baits or natural baits fished along the sandy gravel flats not far from the lighthouse. The inside waters of Clayoquot Sound now offer the season’s finest action for Coho Salmon on Flies or light tackle, with strong numbers of hungry and aggressive Coho cruising through local Kelp forests and among Tofino’ s coastal islands. Cast flies or trolled Buck-tail patterns in greens, blues and purples are go to colors, with small spoons or hoochies in chartreuse will often get it going. Tofino’s inshore fishery has unfolded as one of B.C.’s premier protected light tackle fishing options for all types of experience levels and vessel sizes, including recent growth in Kayak fishing. Saltwater Fly fishing has enjoyed increased growth for years on Vancouver Island, with Tofino area options as prime as ever. An important regulation change for the 2010 season starting August 1st, the inside waters of area 24 will be non-retention for all Chinook Salmon regardless of size. Regulations continue to allow 2 Chinook Salmon over 45 cm. in offshore waters in area 1-24. In the event of catching a Chinook Salmon while fishing inshore during August and September, anglers are reminded to leave the Chinook Salmon in the water, and remove the hook quickly and carefully to support survival rates for these precious wild Clayoquot Salmon. Coho Salmon can still be retained in this area, with the daily limit of 2 per person increasing to 4 per person starting September 1st. Updated fishing and regulations information is always available at Tofino’s Fly and Tackle store on Campbell Street or by logging on to www.tofinofishing.com. 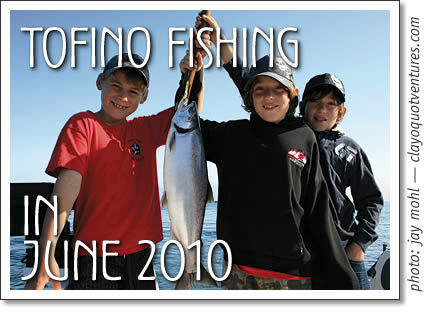 Tofino fishing report for Tofino, Ucluelet and Clayoquot Sound by Tofino fishing guide Jay Mohl for Tofino Time Magazine in August 2010.